Getting new siding on your house can give it a brand new look. After you choose the color you want, we will start the project and keep you involved to insure you are satisfied. We remove the old siding and show you if there is any rotten trim that needs replaced. Our roofing repair guys know what a hassle any roofing problems can be, which is why we’ll always respond to any requests for service as quickly as possible. And because all of our roofing guys are licensed, background checked, and professionally trained, you’re guaranteed to receive the best quality service and workmanship available when you call us. When putting new siding on your home, we first make sure the proper materials are installed under the siding. It is essential to make sure that no water penetrates through the walls of your home. Otherwise you could be looking at dealing with severe water damage causing your home to mold or the wood to rot. During the installation of new siding, we will wrap your home in a watertight house wrap to proctect it from the weather. Depending on the size of your home, you can expect it to take 1 to 3 days to replace all of the siding. Before they begin work, inspect the siding materials to be sure they are the proper style and color you ordered. We will also make sure thorough cleanup of construction debris is done during and after the job. Depending on how much of your old siding is removed, we may need to bring in a dumpster which is great for keeping the perimeter of your home cleaned up from scraps. Once the job is complete, we will ask you to walk around the entire house so you can give us your final approval. Our goal is 100% satisfaction guaranteed. We will also go over the warranty provided by the siding manufacturer and the service warranty that we offer. The siding or wall cladding to your home is a protective material that plays an incredibly important role in protecting your home and insulating it from harsh weather conditions. During the colder winter months, for example, siding prevents cold air from entering your home and traps the available heat inside your home. M&J Roofing and Exteriors offers high-end siding replacement solutions to homeowners in Indianapolis. 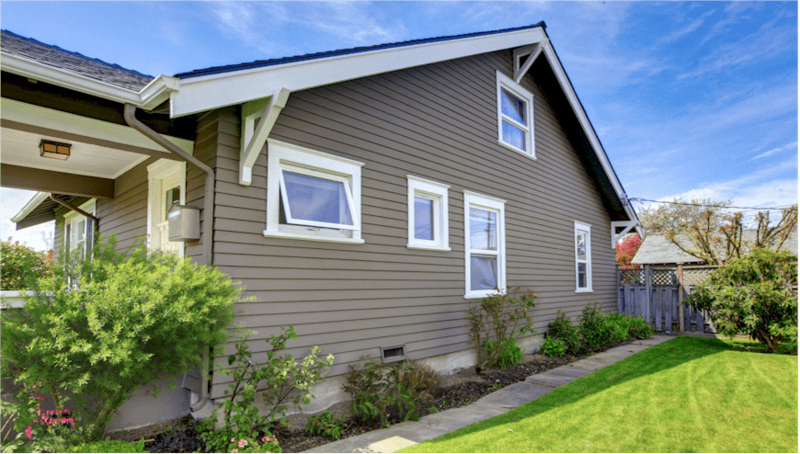 Keep reading to learn more about home siding, the advantages of vinyl siding, and when you should start thinking about replacing your existing siding. Vinyl siding consists of long pieces of polyvinyl, which is also called PVC. Property owners in Indianapolis prefer vinyl siding as it has many advantages. The reasons to choose vinyl siding are listed below. Vinyl siding is more affordable than most other siding types. One of the main contributors to vinyl siding’s cost-effectiveness is the fact that that it is easy to install. Vinyl can also be placed over existing siding. Since you don’t have to remove the current layer of siding, the cost of installation goes down significantly. If you want to install vinyl siding, you can choose from many different colors, including earthy tones and brighter hues. You can also choose from different textures and styles, including vinyl siding that looks like wood or log cabins. Vinyl siding keeps heat in well during the colder winter months. Since the heat that is inside your house can’t escape through the vinyl siding, the costs of keeping your home warm decreases. If you are looking to improve your home’s energy efficiency, installing vinyl siding will go a long way. Vinyl is one of the siding types with the most extended lifespans. Since vinyl is incredibly resistant to harsh weather, extreme temperature fluctuations, and physical damage, it can last for as long as fifty years, if not longer. Vinyl siding is not an organic material like wood and, therefore, not a food source for termites and other common pests. Additionally, foam backing fills that gap between the siding in the walls where pests like to make a home. If you have noisy neighbors or if you live next to a busy street, installing vinyl siding can help you get some peace. Vinyl siding can reduce outside noise by as much as 39%. If you are planning on selling your home, one of the most effective ways to increase the market value of your property is to install vinyl siding. Since vinyl siding increases energy efficiency and improves your home’s aesthetic appeal, you can list the siding as one of your home’s key selling points. Vinyl siding works for houses of all types, materials, and sizes. This siding type’s wide range of benefits makes it one of the most popular among homeowners in the country. M&J Roofing and Exteriors specializes in the supply and installation of vinyl siding in Indianapolis homes. However, as a property owner, how do you know when it is time to get new siding? Let’s take a look at some of the indications that it is time to get new siding. Loose siding doesn’t only look terrible, but it also doesn’t insulate your property. The most common causes of loose siding include wind damage, poor installation, or property foundations that may be shifting. If your heating and cooling costs are increasing, it is an indication that your siding is not doing a proper job of insulating your property. Although a re-installation can help, the chances are that the only solution is to get new siding. Severe hailstorms can be detrimental to your home’s siding. Hail damage doesn’t only affect the appearance of your siding but also its insulating properties. Unfortunately, no repair job can remedy severe hail damage, and you may have to consider getting new siding. If moisture finds its way in between the siding and the wall or if the siding was installed over the moisture, you may notice bubbling on the surface of the siding. Exposure to extreme heat can also cause blistering. There are no repairs that can restore the siding’s insulation qualities in the case of bubbling or blistering, and you will have to replace your siding. Sometimes a vibrant siding appearance can look fitting with the current design trends. As time goes by, however, the siding can appear outdated or old-fashioned. An old siding can also make it difficult for you to sell your home. Dry rot is damage caused by a fungus that lives of moisture in your wall. Dry rot can be particularly damaging to wooden sidings. Vinyl siding colors that are starting to fade can look unattractive and can also be an indication that the siding is too weak to protect your home’s walls. Siding that fades is also an indication that siding reached the end of its lifespan. M&J Roofing and Exteriors provides high-quality house siding installation services to property owners in Indianapolis. If you notice any of the indications listed above and you want to install new siding to your home, contact for a free estimate on siding.